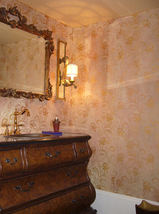 Fauxtastic Wall Finishes and Designs are composed by the creative and skilled artisans, Randy Ingram and Ellen Benson. 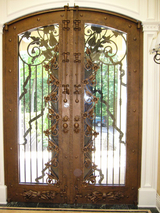 Based in central New Jersey, Randy and Ellen have over 20 years experience in the painting arena. Our philosophy is simple. Everyday, we aim to “raise” the proverbial “bar” in customer service and satisfaction. In order to accomplish this, we consistently strive to improve as artists, both technically and creatively. By exchanging information and opening our minds to innovative ideas, we keep our passion for art ignited and continue to develop as individuals. Through travel and astute observations, we endeavor to learn something new each day. We are intent on representing ourselves as the professionals we know we are by responding to business in a timely fashion and staying competitive in the marketplace. In our dealings with each other as well as clients, we subscribe to the philosophy that every individual should be treated with consideration and respect. Ultimately, through the combination of all these factors, we are determined to provide the best service, exemplified by a quality product that is second to none.